Now we are affiliated with 21 jurisdictions, 22 parishes, and 61 paranormal exorcist investigators in many states and countries. Members are from many religious orders; priests, seminarians, paranormal investigators, and bishops of many jurisdictions, from around the world. They make up the membership of the Order of Exorcists at The Sacred Order of Saint Michael the Archangel. Our priests are available, after the medical and psychological reports are reviewed, with the approval of their bishops, to perform the rite of exorcism. Our Investigation & Assessment Team are paranormal exorcist investigators. They make the initial first contact with the clients that are requesting a demonic investigation and/or exorcism. In staying within the biblical teaching “That which is freely obtained should be freely given”, the exorcism will be done without charge. Each member of our team are servants of our Lord Jesus Christ and are trained to be exorcist warriors in the war of good versus evil. Our team members belong to the religious Order of Exorcists called The Sacred Order of Saint Michael the Archangel. Our members are seminarians, priests, and bishops from many jurisdictions and religious orders. Each clergy member is a priest or bishop and are from many jurisdictions around the world. They join the team of investigators after they have conducted a demonic investigation and submitted an assessment report which shows evidence of demonic involvement. After the case has been approved, a clergy member joins the team to perform the ritual of exorcism. The Order of Exorcists is autonomous and independent branch of the Catholic faith which derives from the ancient Old Roman Catholic Chuch of the 12th Century. The Order of Exorcists is under the Independent Catholic jurisdiction of The Sacred Order of Saint Michael the Archangel which is a Traditional “Old” Roman Catholic Order with valid Lines of Apostolic Succession. In 1980 the Order was known as a small Independent Traditional “Old” Roman Catholic Parish, located in Highland Park, California. It was called Saint Michaels Catholic Parish. With many outreach programs in the communities of Glendale and Eagle Rock, the Church started to received requests from people claiming symptoms of demonic possession and wanted the church to send a priest to there homes. 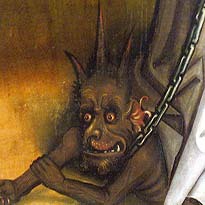 More calls started to come in regarding demonic investigations. People started requesting for help from outside our geographical area. With not enough clergy, the Presiding Bishop, The Most Reverend Ron Feyl decided to reach out and recruit members of the clergy from other jurisdictions; parishes/churches outside the area. In 1981, the Church established a full-time exorcism ministry called The Sacred Order of Saint Michael the Archangel – Order of Exorcists, where trained priests would be available when needed, in the role of an exorcist. 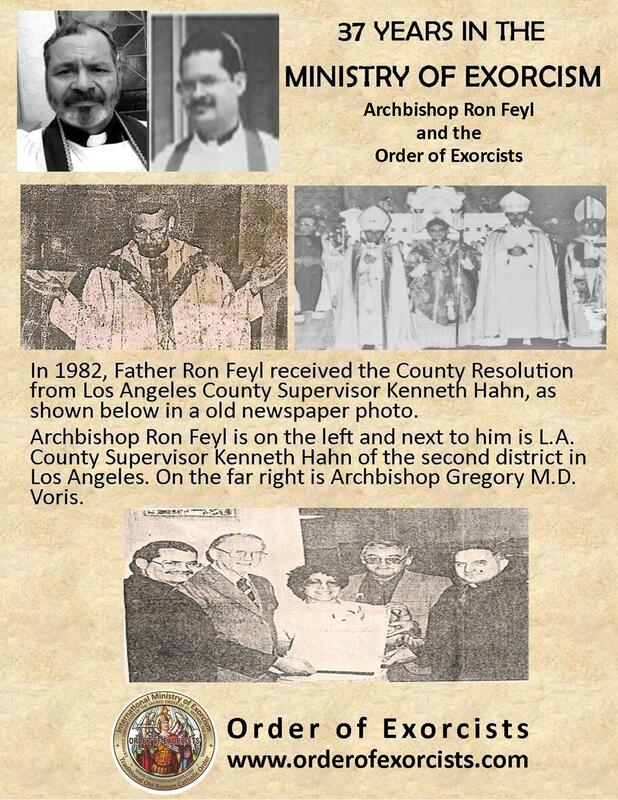 Archbishop Ron Feyl and The Sacred Order of Saint Michael the Archangel-Order of Exorcists is NOT under the Vatican. It is an autonomous and independent branch of the Catholic faith which derives from the ancient Old Roman Catholic Church of the 12th Century. We believe and profess with firm faith each and every truth which is contained in the symbol of the Faith of which the American Traditional Catholic Church/The Traditional Old Roman Catholic Church/The Sacred Order of Saint Michael the Archangel-Order of Exorcists makes use of and teaches, namely: We believe in one God, the Father Almighty, maker of heaven and earth, and of all things visible and invisible. And in one Lord Jesus Christ, the only-begotten Son of God. Begotten, not made, being of one substance with the Father: by whom all things were made. Who for us men and our salvation came down from heaven. And was incarnate by the Holy Ghost of the Virgin Mary: and was made man. He was crucified for us, suffered under Pontius Pilate, was crucified, died and was buried. He descended into hell and on the third day, He rose again according to the Scriptures. He ascended into Heaven and sits at the right hand of God, the Father. He shall come again in glory to judge the living and the dead: of whose Kingdom there shall be no end. I believe in the Holy Ghost, the Lord and giver of life: Who proceeds from the Father and the Son. Who together with the Father and the Son is adored and glorified: Who spoke through the prophets. And in One, Holy, Catholic and Apostolic Church. I confess one baptism for the remission of sins. And I look for the resurrection of the dead, and the life of the world to come. Amen. We resolutely accept and embrace the traditions of the Holy Apostles and all other traditions of the Church and all its observances and regulations. 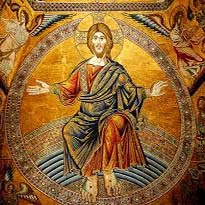 Likewise, We accept the Sacred Scriptures in that very sense in which Holy Mother Church, whose right it is to declare their true sense and meaning, has held them and holds them now; nor will We ever accept or interpret them in a way contrary to the unanimous agreement of the fathers of the Holy Catholic Church. We further profess that there are seven true and proper Sacraments of the New Law, each instituted by Jesus Christ, Our Lord for the salvation of the human race, although not all of them are necessary for everyone, namely Baptism, Penance, Holy Eucharist, Confirmation, Matrimony, Holy Orders and Extreme Unction; that these confer grace and that of these, Baptism, Confirmation, and Holy Order cannot be received a second time without sacrilege. We further profess and affirm that these same seven sacraments were instituted by Our Lord for the living and that no person who has reposed may receive or have these sacraments administered to them posthumously. We also accept and adhere to the rites of the solemn administration of the aforementioned Sacraments according to as they have been accepted and approved the Catholic Church. We embrace and accept each and every tenet concerning Original Sin and Justification which was defined and declared by the Council of Trent. We likewise affirm that in the Mass there is offered to God a true, worthy, and expiatory sacrifice for the living and the dead; and that the Body and Blood of Our Lord Jesus Christ, together with His Soul and Divinity are really and substantially present in the Most Holy Sacrament of the Eucharist, and that there occurs a change in the total substance of the bread into His Body and of the total substance of the wine into His Blood, which changes the Catholic Church calls Transubstantiation. We confess also that Christ, whole and entire, and the true Sacrament are received under either species. We firmly hold that there is a Purgatory and that the souls detained there are helped through the prayers of the faithful; similarly, that the saints who reign with Christ are to be venerated and invoked, and that they offer prayers to God for us, and that their relics should be venerated. We firmly assert that images of Christ and of the Most Blessed, Ever-Virgin Mary, as well as the images of the saints should be retained and shown due honor and veneration. 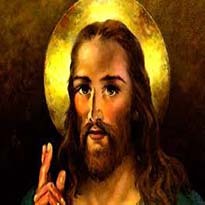 We also affirm that Christ left the power to grant indulgences to the Church and that these are most useful for the salvation of the Christian people. We acknowledge the Holy Catholic and Apostolic Roman Church to be the Mother and Teacher of all Churches and We vow and swear true obedience to the Roman Pontiff, the Vicar of Jesus Christ, and the Successor of Blessed Peter, the Prince of the Apostles. We affirm and accept those pronouncements concerning the Most Blessed Ever Virgin Mary particularly the Dogma of the Immaculate Conception of the Blessed Virgin Mary and the Assumption of the Blessed Virgin Mary. We moreover maintain and profess, without doubting, all the other teachings handed down, defined, and declared in the sacred canons by the Ecumenical Councils, especially by the Most Holy Council of Trent, and the First Vatican Council, particularly that of the Primacy and Infallible Magisterium of the Roman Pontiff and at the same time We condemn, reject, and anathematize all opinions to the contrary, and all heresies which the Church condemns, rejects and anathematizes. We shall most constantly hold and profess this true Catholic Faith, outside of which no one can be saved, and which We now freely profess and truly hold. With the help of God, We shall possess it whole and unblemished until my dying breath; and to the best of my ability, We shall see to it that my subjects and those entrusted to me by virtue of my office hold it, teach it, and preach it. Our investigation teams are available worldwide, to churches, paranormal investigation groups and people who are in need of our services. Clergy and experienced “lead” paranormal investigators are welcome to join the fight of good versus evil, in the Order of Exorcists. Our main function is to help people who are experiencing symptoms of demonic possession, house disturbances due to evil spirits, demons, hauntings, demonic infestation or demonic possessions. We should be your last call for elimination. 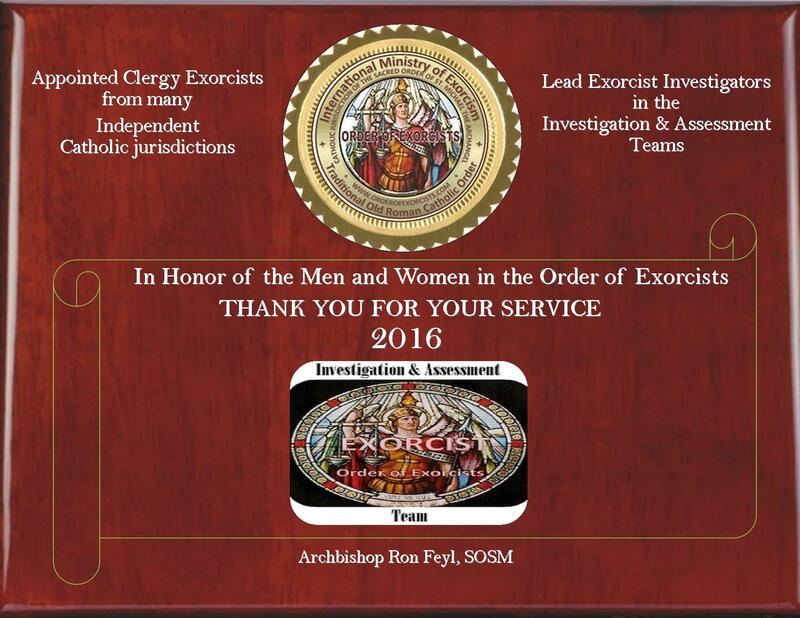 We are a group of professional specialist who are not only trained investigators but real exorcist investigators with clergy who are exorcist. When needed, our team of appointed clergy exorcists who are “Traditional” Catholic clergy who perform exorcisms and house blessings to expel demonic spirits, negative energies, evil and unwanted paranormal phenomena. 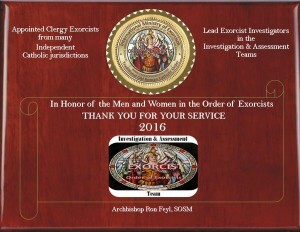 Our exorcist investigators specialize in demonic investigations. They do the first contact interviews, investigation & assessments and work with our team of exorcists if an exorcism is needed. If you have already contacted a paranormal investigation group and want more, in regards to eliminations, from demonic evil spirits, demons, hauntings, and poltergeist, than contact us. It is not uncommon when paranormal investigation groups and even clergy would call for assistance from paranormal eliminator or exorcist for the final elimination process. Paranormal elimination from our group is a specialty. You should contact us If you are experiencing the following: *Sound of footsteps on the stairs or floors, *Sound of voices or animal sounds in rooms and walls, *Bad odors with no natural explanation, *Moving black shadows on floors and/or walls, *Tapping or knocking noises in walls or on the floors, *Clock hands moving backwards, *Lights turning themselves on and off, *Electronic equipment like radios and televisions turning on or off, *Black human figures that move or stand, *Black clouds of smoke that move around and do not dissipate, *A evil spirit that is interacting with you or a household member, *Demonic possession of a household member. Look for any sounds, visual effects, odors, or changes in room temperature. Our “Exorcist Investigators” will respect your confidentiality while providing a full investigative assessment analysis. At the time of our final analysis the Exorcist Investigator will have a profile of the phenomena and contact the Order of Exorcists for elimination of any paranormal demonic entities, cold spots, and paranormal behavior, by house blessing and/or exorcism rituals. Our service is not just about confirming your paranormal phenomena, but, more importantly, terminating the problem, through exorcism, prayers, the use of holy water, holy oil, and salt along with other elements as required.